Washington Post Quick and easy garnishes can glam up your plain, boring food. My favorite scene in “The Wizard of Oz” has always been when Dorothy steps out from her tornado-swept house into a land of color. Gray, gray, gray and then, bam! Sometimes I get the same feeling when I'm looking at a plate of food that just needs ... something. I rummage around the fridge, looking for a sauce, pickled vegetable, chutney, anything to get the dish to Technicolor. But you needn't always leave such aha moments to luck. Using a combination of pantry or refrigerator staples and a few items you make specifically for the purpose, you can take your dishes from boring to brilliant. Whether you are stuck with a plain protein and starch or leftovers in need of an upgrade, these are some garnishes and additions to consider, arranged by category. Pick one or several (some fall into multiple categories anyway), and have fun with them. Or crispy or crackly, or whatever word you like, as long as it's something that gives you a textural pop. Like most of the garnishes here, there isn't only one type of dish crunchy food will complement. I think they're especially at home on top of a soup or salad, where you might want a contrasting texture. Whole roasted, spiced chickpeas are easy to do at home, and given that they are one of the trendier snacks of late, why not keep a bag in your pantry, too? Indian markets are gold mines when it comes to these types of garnishes. Look for bags of whole or split fried and spiced beans, as well as snack mixes that include them along with nuts, fruit and short threads of chickpea noodles. Nuts on their own are another option. Ideally, they would be toasted – small amounts in a skillet over medium heat and larger in a 350-degree oven for 8 to 10 minutes. Others receiving votes: Crispy shallots (store-bought or homemade), chicken or pork skins, and slaws. Sauces are a little bit like your condiment passport. So, where do you want to go? Part of that depends on what you're looking for. If you want a combination of spice and sweetness, choose an Indian chutney (mango is my favorite, and I just use a jarred brand) or Mexican salsa, the latter of which can be chunky or, well, saucy. Chutney pairs well with cheese in a sandwich or on a board, and salsa can glam up anything from scrambled eggs to, of course, tacos. A dill or mint yogurt sauce adds a Mediterranean accent to grilled meat or a grain bowl. Ditto hummus, whether you whir together your own or grab a tub at the supermarket. If your taste leans more toward Spain, you can't go wrong with romesco, a smoky-pepper-and-tomato sauce that is at home on almost any protein or grain, or as a dip. And don't forget the trusty vinaigrette, which can be way more interesting than just plain olive oil and vinegar. Add fruits or herbs for a homemade version that pairs well with what you're dressing. Vinaigrettes aren't just for salad either. Use them as a dip, marinade or a drizzle for a soup in need of resuscitation. Yes, the incredible egg deserves its own category. To call it a garnish may even be an injustice, because adding it can turn almost anything insufficient into a real meal. And you almost always have them around. Add an egg to leftover takeout rice along with some veggies and you've got fried rice. A crispy fried egg over roasted vegetables can be a light, seasonal meal. A poached egg, runny yolk and all, can double as a sauce in your grain bowl. Or put together an impromptu eggs Benedict with an English muffin and whatever extra veggies or meat you have. Hard-boiled eggs contribute heft to salads, sandwiches or tacos. Pickled foods deliver a one-two-three-four punch of crunch, sweet, salt and spice. Use them to perk up a sandwich or plate of nachos. Because their flavor is so piercing, they're perfect for cutting through the richness of a creamy egg or chicken salad or a gooey grilled cheese. For a quick DIY garnish, there's no need to go the whole canning route. Small-batch refrigerator pickles are easy to throw together on a weekend (or even a weeknight) and will give you a good few weeks of use. When the banana pepper plant my mother-in-law planted for us went bonkers, I took the surplus and just poured hot vinegar seasoned with salt and sugar over the sliced rings and stored them in a couple of half-pint jars. Hot peppers are ideal for this type of prep. Pickled onions are versatile as well. Or don't worry about making your own, because pickled foods are all over the grocery store. Naturally, there are cucumber pickles in all kinds of shapes, sizes and flavors. Other pickled/fermented foods to consider: Olives, green beans, capers, sauerkraut and kimchi. Almost anything can be doctored with a little – or a lot – of heat, depending on your taste. It's a matter of what type of garnish you're looking for and whether you want it combined with other flavors. For straight-up heat that is more inconspicuous, grab the crushed red pepper flakes or hot pepper sauce, whether it's runny, like Tabasco, or thicker, like Sriracha. If you want something funky and spicy with crunch, pull out the kimchi. If you want that kind of flavor but without the veggies, you can get a similar effect with nuoc cham, a Vietnamese dipping sauce made with fish sauce and some kind of spice, such as sliced hot peppers or Sriracha. A sweet spice is another way to go, as in hot honey or even salsa. 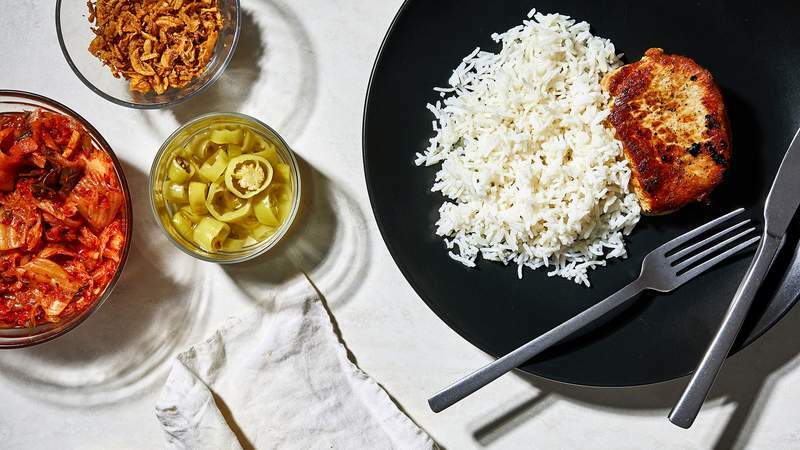 For a paste that can be stirred in but lends both color and heat, consider harissa or zhug, the herb-based Middle Eastern condiment that is quickly catching up to harissa in popularity. Raid your produce bin for leftovers or buy a few things that you can specifically use on a flexible basis. You probably already have your favorites to use raw (for me: mango, cilantro, cherry tomatoes), but you can do a little extra cooking to bring some more pizazz to the table. One of my new go-to this summer has been blistered cherry tomatoes. You can do this in the broiler, but I've also charred mine in a skillet over medium-high heat with olive oil, salt and pepper. Be warned: You may eat them all before you get a chance to use them on other dishes. Caramelized onions are classic for a reason – sweet, jammy and beautifully colored, they add an instant feeling of luxury. Similar to eggs, cauliflower florets roasted at a high temperature can transform a bowl of grains from a side into a main course. Have potato peelings? Roast those skins with herbs and olive oil – or bacon fat if you have it – for a crispy, flavor-packed garnish. Corn relish makes for a prime topping, and this is the time of year to do it. These types of garnishes will help counteract other acidic or spicy ingredients and add richness. Yogurt sauce falls into this category. A slab of melted brie over a plain piece of meat feels like a million-dollar improvement. Or go for mozzarella if your tastes lean toward the less funky (and cheaper). You can go the other direction with cheese, too, employing it as a garnish that can enliven more mellow flavors. To add savory depth, start grating some Parmigiano-Reggiano – finely shredding to melt into a dish and large, wide curls for textural and visual interest. Like pickles, briny feta is especially effective at bringing an assertive salty edge. Goat cheese works much the same way, except with a grassier flavor and creamier consistency. Don't forget about blue cheese. Creamy doesn't have to mean dairy, though. Guacamole tops my list. And four-ingredient cashew cream is another versatile choice, as is hummus or tahini, whether used on its own or mixed with herbs and spices.